Robert Edward Knievel, better known by his stage name Kaptain Knievel, was born on the 7th May 1962, in Butte, Montana, USA, and is best known for being not only a stunt performer, but also a daredevil, who has made over 300 jumps and 20 world record jumps in his career. He is recognized for jumping the Grand Canyon, and flying from building to building, among many others dangerous activities. 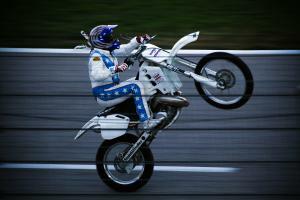 He is also known as the son of legendary stunt performer Evel Knievel. So, have you ever wondered how rich Robbie Knievel is? It has been estimated from authoritative sources that the total size of Robbie’s net worth is over $10 million, as of early 2016. Most of his income has come from his professional career as a daredevil and stunt performer. Another source is coming from his ownership of several companies and shops, as well as his appearances in several TV series. Robbie Knievel was raised with three siblings by his father, who was one of the most famous stunt performers Robert “Evel” Knievel, and his mother Linda Knievel; Robbie is named after his grandfather. Robbie’s professional career began when he was still a child, at the age of four; under the influence of his father; they performed together. Thus, before his seventh year, he already ridden a motorcycle. His first jump came with his father when he was eight years old, participating at an event held in Madison Square Garden. Subsequently, when he was 12 years old, he went on his first official tour with his father, and performed as an opening act. However, he soon left his dad to start a career on his own; his net worth was already established. So far, Robbie has performed more than 350 specifically spectacular jumps and stunts on motorcycles, which is the main source of his net worth. Some of his jumps have been televised, including “Caesars Palace jump” in 1989, “30 Limousines jump, in 1998, “The Grand Canyon jump” in 1999, and “The Mirage Hotel jump” in 2008, among others, all of which added to the overall size of his net worth. To speak further of his accomplishments, as a daredevil, Robbie has jumped over 24 Coca Cola Zero truck cabs at The Kings Island Amusement Park in 2008, and back in 2003, he leaped over 15 Diet Pepsi trucks. Furthermore, in 2011 he leaped 150 feet over tractor trailer trucks in an event held at the Spotlight 29 Casino, located in Coachella, California. In addition to his professional career, Robbie has also started a company named Knievel Motorcycle Manufacturing Inc., which produces custom made motorcycles and equipment, and also sells some of Robbie’s clothing items. Furthermore, he has launched Knievel’s Custom Cycles, a custom motorcycle shop located inLake Hopatcong, New Jersey, all of which have contributed significantly to his net worth. Other than that, he had his own TV show on the A&E network, entitled “Knievel’s Wild Ride” (2005). He has also appeared in the pilot series “Hollywood Stunts”, alongside Lee Majors and Spanky Spangler. These appearances increased his fortune considerably. If to talk about his personal life, Robbie Knievel was in a relationship withJenny McShan, but other information about him is unknown, except the fact that he is the father of two daughters, and he has two grandchildren. 1 Athletes have other athletes as competitors. My competitor is death. 1 Brother of Kelly Knievel, Alicia Knievel, Emma Knievel and Tracy Knievel. 2 Ex-stepson of Krystal Kennedy-Knievel. 3 Father of Krysten Knievel. 4 Son of stunt-person Evel Knievel and Linda Knievel.